Another huge day in the massive career of Andy Murray. After the nerve jangling five sets against Fernando Verdasco comes the challenge of the giant, big serving Jerzy Janowicz in the Wimbledon semi final. Like his national football team, Murray is no stranger to putting his fans through the wringer. Unlike Scotland, Murray - four finals, five semi finals and a quarter final in his last ten grand slams - has a knack of getting the job done. "If I could finish my tennis career and then somehow go back and try again at football, I would have been interested to have given it a go. I have absolutely no idea if I'd have made it but I would have given it a good shot, I would have tried hard." What Gordon Strachan would do to have someone of Murray's talent and dedication swapping his Adidas tennis shoes for Adidas football boots (like these). It became a recurring theme of last year's Olympics to compare Team GB's medal winners to footballers. Footballers generally didn't fare well in the comparison. That was unfair. There are a lot of footballers who work hard to sweat every ounce of value from their talent. Sadly their stories don't sell newspapers. And recent generations of Scottish footballers haven't had the talent of Murray to use as a stepping stone to headline grabbing greatness. 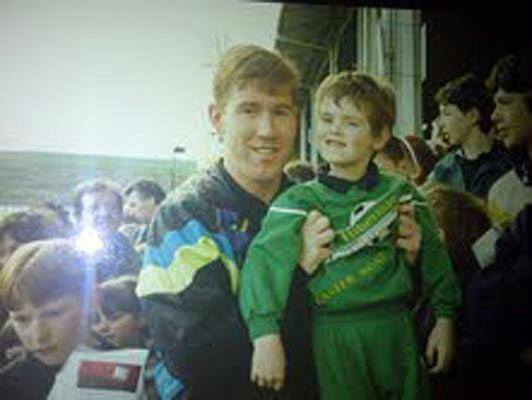 Certainly when Murray was a Hibs supporting youngster contemplating a trial with Rangers, few people would have imagined Scotland producing a world class tennis player before we produced another world class footballer. But here he is. Murray, the golden boy holding his own in a gilded generation, as successive Scotland football teams huff, puff and fail. His success won't turn us into a nation of tennis lovers, the general impression is that it is Murray's career rather than the sport that is followed. We don't - yet - have the sporting infrastructure to support a new generation of mini-Murrays holding their own on the world stage. But he will inspire a lot of youngsters to choose tennis over other sports when they shop at one of the big boys like Millet Sports. Sportsmen might not ask to become role models but it is a position they are expected to fill. It might make Murray uncomfortable but he does it almost faultlessly. Since sport became a 24 hour media obsession, Scottish football has failed to produce an on field talent that has come close to enjoying his stature. For most of the tennis year he grabs the spotlight - turning it away from the ginormous failure that is the LTA's vision for British tennis. He gives the sport a narrative that grabs the imagination. Lacking a world class lightning rod, Scottish football sees the focus shift to administrative squabbles, financial shenanigans and soul searching over repeated failures. The reserved Murray has the talent to create a feel good factor that carries his sport to the front pages for the right reasons. How Scottish football would benefit from another Denis Law, another Kenny Dalglish coming along and doing the same. For now we'll just need to make do with the vicarious pleasure of following Murray. Winning Wimbledon has become a hoodoo for British men's tennis to rival his Hibs team's Scottish Cup travails. We have to hope that tennis, unlike Hibs, has finally found its man.